PRESALE ON SOUNDPROOF(ER) SOUND BOOTH 2018. Are you trying to practice your singing or play instruments at home, but neighbors are complaining? 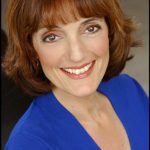 Want to record Voice over, or a new song, but it is too noisy outside? The solution is coming! It is efficient, convenient and portable. It is our new Soundproof(er) Sound Booth SPB33 and SPB66. This NEW MODEL was completely redesigned to improve efficiency, convenience and appearance. and SPB66 Mobile Sound Booth 6 x 6 with Soundproofing (Drum room Size) in limited quantities. The PreSale starts June 15, 2018. Use coupon spb-20. ( expires June 25. 2018). Use coupon spb-15. ( expires July 06. 2018). Use coupon spb-10. ( expires July 16. 2018). and Just for procrastinators we will extend the discount time from July 16 to July 20, 2018 – Use coupon Code spb-5 for “Better late than never! ” 5% off. We have two models available SPB33 Mobile SoundProof(er) SOUND BOOTH 3 x 3 New 2018 model and SPB66 Mobile Sound Booth 6 x 6 with Soundproofing (Drum room Size) in limited quantities. So do not wait – order now! We are also introducing new size of acoustic blankets – Studio size VB77G and VB76 G which are 3 meter tall and 2 meter wide, which quickly became very popular in the United states among Broadcast and radio stations and professional audio recording studios. The Vomo product is excellent in many respects ! I Like Yours (portable vocal booth) The Best! 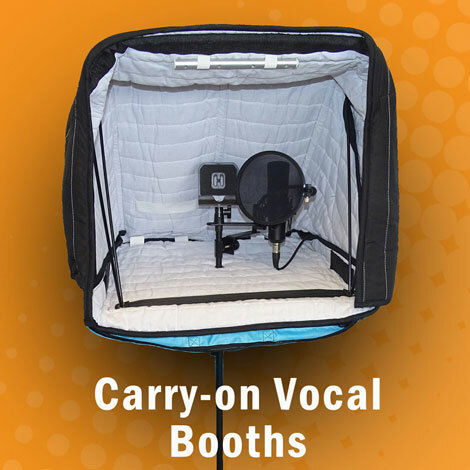 "Your design [Carry-On Vocal Booth] is lighter, easier to use, sounds better, and, in my opinion, far more functional than any other portable VO booth I've seen. Harlan's booth uses Auralex pyramid foam, which does a good job of diffusing the sound, but does only a fair job of absorption . . .I like yours much better!" The Hanging Vocal Booth Made My Day! "This is really going to help me progress in this great buisness. I live on the gulf coast, and there isn't access to many studios so I was trying to make my own in my home.The hanging booth will instantly improve on the quality of my recordings. 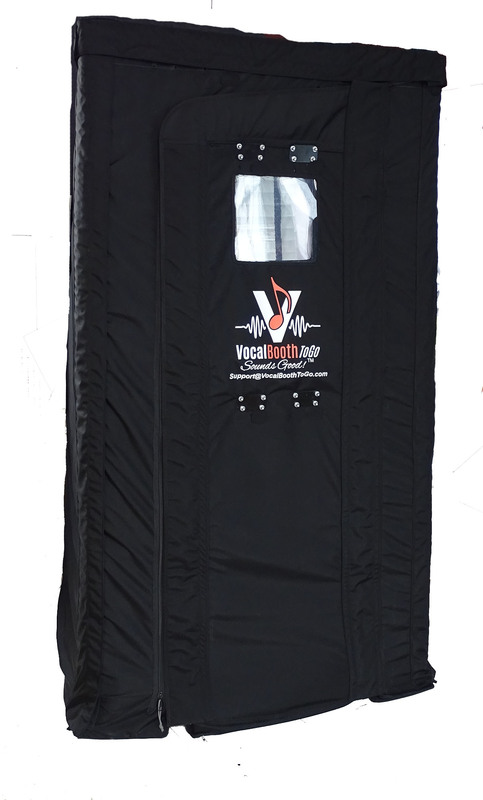 Once again, great product ....... "
Vocal Booth– An “A” and Delivers Exactly What It Says! 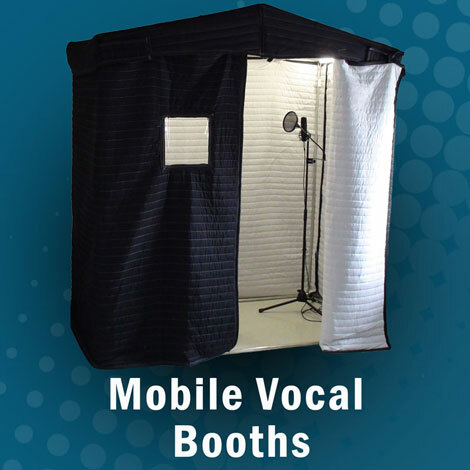 "The Vocal Booth on Tracks in an Option for Space Challenged Voice Talents . . . and Yahoo! 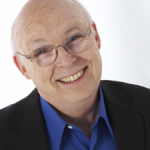 I now have my own recording room and, even better, I can whisk its walls aside whenever I need to." 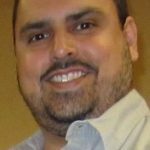 "Your Producer's Choice Sound Blankets are terrific! 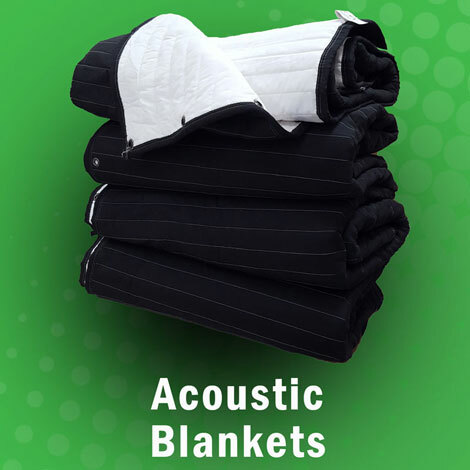 The Producer's Choice acoustic blankets are terrific! I use them in my studio. These are not just regular sound blankets. They totally work! Nice quality and affordable. You don't have to spend a lot of money on foam."